The Onyx Boox M96 is one of very few 9.7-inch E Ink ebook readers available on the current market (see my M96 Universe Review here). Luckily the device is a good one for the lack of competition, and now there’s a newer model that’s even better. 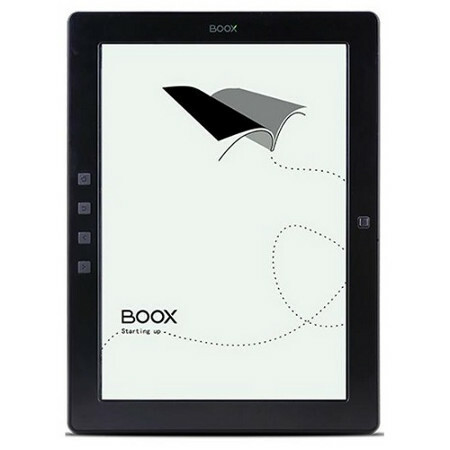 The Germany-based eReader-Store.de website has started selling the Onyx Boox M96C. It’s basically the same exact device as the original M96, but it adds a capacitive finger-friendly touchscreen, whereas the regular M96 has an electromagnetic touchscreen that requires using a stylus. Aside from the touchscreen difference all the specs and software appear to be exactly the same between the two models. Both run Android 4.0.4 and come with Google Play onboard to install Android apps. One difference with the description page for the M96C is that it says an update for Android 4.4 will be coming soon (makes you wonder if the regular M96 is going to get Android 4.4 at some point too, same goes for the Onyx Boox AfterGlow 2). The M96C has an E Ink Pearl screen that measures 9.7-inches diagonally. The resolution is 1200 x 825 (don’t let the lower resolution fool you; text looks fantastic on the M96’s large E Ink screen, very bold and dark). The large screen makes the M96 one of the better options for a PDF reader, and the Onyx software comes with a PDF app with loads of options (see my M96 PDF review here). Other features for the M96C include 4GB of internal storage space (2.27 GB is available), 512 MB of RAM, there’s an SD card slot for cards up to 32GB, it has a 1600mAh Li-Polymer battery, and a iMX6 1Ghz processor. The device also features Wi-Fi and Bluetooth. Presumably there’s a 3.5mm headphone jack and external speaker like the original M96 but neither is mentioned specifically. The Onyx Boox M96C is currently in stock and selling from eReader-Store.de for 293.28 euros without tax and 349 euros with tax included. Update: Here’s a link to the next article with a YouTube video that compares scribbling and highlighting on both M96 devices. Hey, looks nice to me! No, this one does NOT come with Google Play. Weird, the site says it does. According to the mobileread all latest readers (M96, T68) will get 4.4. I wonder how well this capacitive screen will work with regard to annotating. Here’s the link to a video that compares annotating on both devices. Can you use a pen on it? I was wondering the same thing, but kind of doubt it. Guess we’ll have to wait for some reviews to find out. What a pitty! I bought a M92 two years ago and I haven’t used it much. I wish I’ve waited. They both use the same 9.7″ E Ink Pearl screen, and that’s pretty much where the similarities end. The M96 is a lot more advanced. Weight is about 509 grams for the M96 and 536 grams for the DX. The M96 is more like a tablet, so yeah there’s no problem downloading library books and books from Amazon, although I don’t like how the Kindle app renders text so I personally don’t use it—I convert with Calibre instead. See my M96 review for more details about the device.